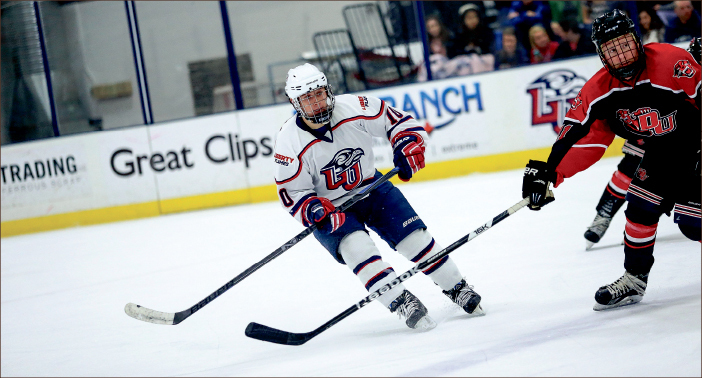 The Liberty Flames Division I (DI) men’s hockey team (7-1-4) split its weekend series against the Davenport University Panthers (3-2-1) Friday and Saturday, Oct. 17 and 18. Davenport 4, Liberty 3 (SO)The Flames fell to Davenport Friday in the first game, 4-3. The Flames used lineup changes and solid defense in the second and third periods to overcome an early 3-0 deficit to force overtime. The Flames then fell in the shootout period when Davenport outscored them 1-0. The scoring began with 16:50 left in the first period when Davenport’s Matt Ogden scored just inside the blue line. The Panthers then added two consecutive goals with Jordan Simmons and Everett Thompson each scoring in the opening period. The Flames defense found the boost it needed during the break, not giving up another goal for the rest of the game. Division II (DII) goalie Cary Byron entered the game after already playing a full game earlier that day. Byron was helped with quality defensive play, in which Matt Sherry played a big role. Liberty started its scoring with 11:27 left in the second period when Bram Erickson scored following a penalty kill. The Flames then added the second and tying goal in the third period with Paul Lamourex and Luke Simon each finding the back of the net. Lamourex scored for the second time this season and the first time at home. In overtime, both teams were held scoreless. Then, in the subsequent shootout, Davenport’s Cody Walsh scored in the first round. Liberty was then held without a score. Liberty lost goalies Matt Pinel and Josh Halpenny, as well as defensemen Peter Shantz to injuries. Division III (DIII) sophomore Ian Harris started in place of Pinel and Halpenny but was replaced by Byron at the start of the second period. Head Coach Kirk Handy said that both goalies played well, but they were left out to dry from bad defense. Handy also added that not having some guys on the ice may have had a negative mental effect on the team. The Flames commanding 6-3, game-two victory ended a four-game losing streak riddled with frustration. After the final buzzer sounded on Saturday, Oct. 18 and the crowd dispersed, the only sound to be heard in LaHaye Ice Center was Taylor Swift’s “Shake It Off” blaring inside the Liberty locker room. Byron faced 41 shots on goal and stopped all but three pucks, one fired on a Panthers power play. Goaltending aside, addition and subtraction of players from the lineup (the aforementioned loss of Shantz and Miller, as well as the return of freshman forward Lamourex from an injury of his own) was the true theme of the series. Chemistry is key in a sport played in lines and pairings, and the inevitable shuffling of those established in the early season saw the Flames dynamic play go flat. When the puck dropped, Liberty finally seemed to have found the combinations that clicked — most notably the potent forward line of Lamourex and freshmen Luke Hannon and Simon. Of the Flames six goals, Hannon scored five. The first, assisted by Simon and Lamourex, came a minute after the Panthers scored near the end of a quiet first period of even play. Captain Lindsay LeBlanc made it 2-1 Liberty on a pass from Erickson with five minutes to go in the second period. Hannon added his second not long after, with Lamourex again assisting along with sophomore Chase Harris. Freshman defenseman Ben Hughes and Simon helped his third on a power play to kick off the third period. Hannon netted the fourth unassisted in response to a Panthers score. After Davenport put one more away on a power play, LeBlanc and Simon fed Hannon for the fifth and final time of the night. Lamourex, too, was pleased to have finally found his place on the team and help close the chemistry gap that has frustrated the Flames early this year. It has been a season of ups and downs so far, but to get a solid win under their belts and shake off their recent difficulties at home before this week’s three-game series at rivals Arizona State University (ASU) and the University of Arizona (UA) is certainly a boost for the team. They take on ASU at 8 p.m. Thursday and UA at 7:30 p.m. Friday and Saturday. BRITT is a sports reporter.